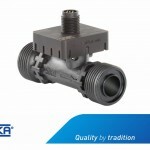 The VZ-S is a gearwheel type positive displacement flow sensor from SIKA which records volume flows of liquids with both high and changing viscosities. 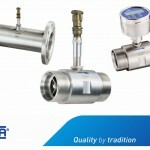 The high-precision sensors work according to the displacement principle. 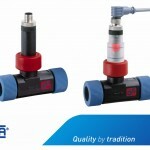 The high resolution combined with reliable measurement accuracy make the sensors especially useful for applications involving the measurement of small and very small volumes. The VZ-S Positive displacement flow sensor is available with a variety of casings and sealing materials, meaning it can be universally used for different measurement media. A very precisely adjusted gear pair within the casing forms the measuring element. The inflowing medium causes the gear pair to rotate. The rotary motion is scanned by contactless sensors. Since each individual tooth generates a pulse, this results in a very high resolution. Consequently, even the smallest volumes can be measured or dosed precisely. The measurement unit contains two pick-offs that are circumferentially offset by ¼ of a tooth pitch to generate a 2 channel flow-proportional frequency signal. 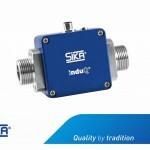 Suitable processing of the signal provides an greater resolution and the option to identify the flow direction. The maximum pressure drop should not exceed 16 bar. This limits the measurement range of high viscosity media (see pressure drop diagrams). Basically, the measurement accuracy increases with increase in viscosity of the media. 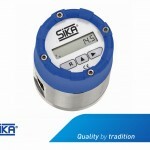 HT version for temperatures up to 150°C with thermally insulated preamplifier (option). 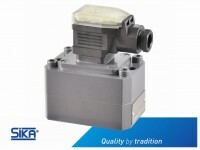 ATEX intrinsically safe version and explosion proof versions available. Variety of casing materials available for different media. Other bearing materials available on request. Flow measurement of paints and varnishes. Ratio control of polyol and isocyanate.